Proposal would create state oversight of the system, plus provide funding to operate it. Chris Detrick | The Salt Lake Tribune Marina Lowe, Legislative and Policy Counsel, American Civil Liberties Union of Utah, speak | Courtesy Photo Kent Hart, Executive Director of the Utah Association of Criminal Defense Lawyers. Scott Sommerdorf | The Salt Lake Tribune Senator Todd Weiler, R-Woods Cross, in the Utah Senate, Thursday, February 21, 2013. Scott Sommerdorf | The Salt Lake Tribune Sen. Todd Weiler, R-Woods Cross makes his presenation about changing the office of Att Chris Detrick | The Salt Lake Tribune Marina Lowe, Legislative and Policy Counsel, American Civil Liberties Union of Utah, speak Marina Lowe of ACLU Utah was a guest on Trib Talk on Thursday, Sept. 18, 2014. Chris Detrick | The Salt Lake Tribune Marina Lowe, Legislative and Policy Counsel, American Civil Liberties Union of Utah, speaks during a Law Enforcement and Criminal Justice Interim Committee meeting about the Federal 1033 Program in the House Building Wednesday September 17, 2014. The Federal 1033 Program distributes surplus military weapons and equipment to local law enforcement agencies. | Courtesy Photo Kent Hart, Executive Director of the Utah Association of Criminal Defense Lawyers. Scott Sommerdorf | The Salt Lake Tribune Senator Todd Weiler, R-Woods Cross, in the Utah Senate, Thursday, February 21, 2013. 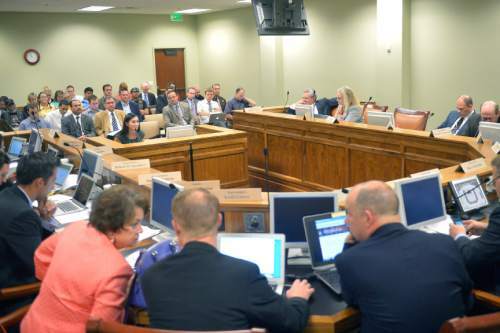 Scott Sommerdorf | The Salt Lake Tribune Sen. Todd Weiler, R-Woods Cross makes his presenation about changing the office of Attorney General to one that is appointed bersus elected before the Legislature's Government Operations Interim Committee. This idea comes in the wake of the scandal currently engulfing Attorney General John Swallow, Wednesday, May 15, 2013. Chris Detrick | The Salt Lake Tribune Marina Lowe, Legislative and Policy Counsel, American Civil Liberties Union of Utah, speaks during a Law Enforcement and Criminal Justice Interim Committee meeting about the Federal 1033 Program in the House Building Wednesday September 17, 2014. The Federal 1033 Program distributes surplus military weapons and equipment to local law enforcement agencies. Marina Lowe of ACLU Utah was a guest on Trib Talk on Thursday, Sept. 18, 2014. 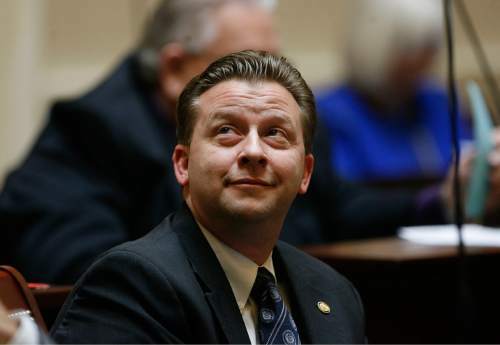 A bill expected to be introduced this week at the Legislature will attempt to tackle the myriad problems plaguing Utah&apos;s indigent defense system. A number of county officials are watching to see how the bill fares before making any changes to how they handle their obligation to provide indigent defense, while advocates for criminal defendants are waiting to see if a lawsuit will be necessary to force needed improvements to the system. Sen. Todd Weiler, R-Woods Cross, said Thursday that his bill wwould create a state commission to oversee indigent defense services. The bill would include state funding  a "couple million dollars," he said  that can be handed out to individual counties. That money could be used to pay for public defenders, expert witnesses or private investigators. Weiler said part of the problem with the current system in Utah  which is just one of two states which delegate their obligation to provide indigent defense to individual counties  is that there is "nobody minding the farm on the state-level" making sure that the counties are fulfilling that duty. "I don&apos;t see any evidence of maliciousness," Weiler said. "… A lot of these counties are just really rural. They just don&apos;t have any money. With the little money that they do have  if they have to choose between roads and hiring better attorneys for poor people  you can imagine they spend money on roads every time." The proposed legislation is a result of four years of study by a state task force, which included hiring the 6th Amendment Center to review the way the accused are being represented. In October, the center released a report which found many flaws in the current system  including that in justice courts, where people often connect with the court system for the first time, over half of defendants are never provided legal representation. The report also found that in district courts, where more people are receiving public defenders, "systemic deficiencies" prevent those attorneys from effectively advocating for their clients. The U.S. Supreme Court ruled in 1963 that any defendant facing possible jail time is entitled to counsel, even if they can&apos;t afford it. How each county handles that responsibility differs. In Salt Lake and Utah counties, a nonprofit public defender association provides services, while other counties rely on contracted public defenders or contract with private attorneys. Lawsuits • But will Weiler&apos;s proposed legislation be enough to fend off a lawsuit? The American Civil Liberties Union said last fall that if changes aren&apos;t made, they will sue the state. 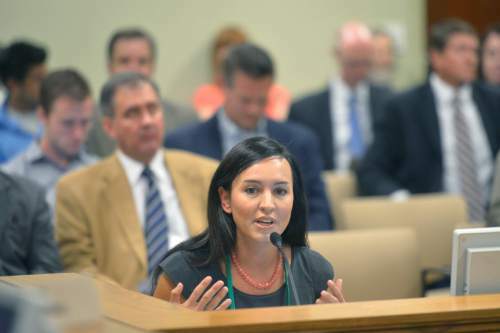 Marina Lowe, legislative and policy counsel for the ACLU of Utah, said Thursday that it was too early to tell whether litigation will be needed, because they have yet to see the exact language in the proposed bill. She said it is important that state lawmakers not only create a commission to oversee the state&apos;s indigent defense, but that they fund it, too. 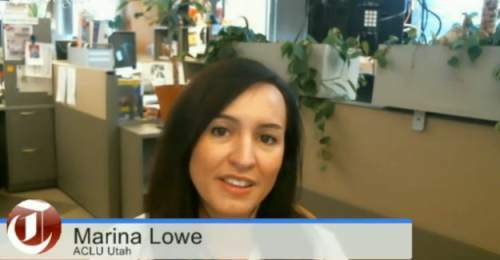 "We think it&apos;s critical," Lowe said. "It&apos;s impossible for me to see how this can be completely solved without some discussion of resources. To the extent that the bill only creates some sort of state-level commission or body? That may be helpful as part of the solution, but it can&apos;t in my mind solve the whole problem." Ask those closest to the situation what is needed to fix the system in a meaningful way, and that is their answer: money. 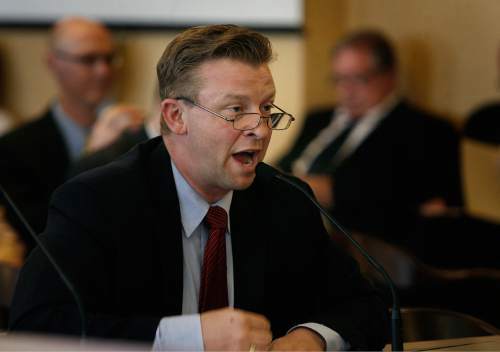 Kent Hart, executive director of the Utah Association of Criminal Defense Lawyers, said he worries that if the Legislature doesn&apos;t provide enough funding, nothing will change and "we are simply kicking the can down the road." "[Counties and cities] treat indigent defense like most other budget items," said Kent Hart, executive director of the Utah Association of Criminal Defense Lawyers. "This is a constitutional mandate. It&apos;s not a decision on whether to fix the roads or build sidewalks or other things like that. This is something that they have to do." Adam Trupp, chief executive of the Utah Association of Counties, said one of the biggest issues in his mind are how much counties are willing  and able  to pay for their public defenders and the process of how the public defenders are selected by county officials. It is also difficult, he said, to find attorneys in rural counties who want to take on a public defender contract. "We, as counties, are contributing $27 million a year to indigent defense," Trupp said. "That&apos;s a big number. If there is a need for substantial changes, then the state should give additional money to make those changes." 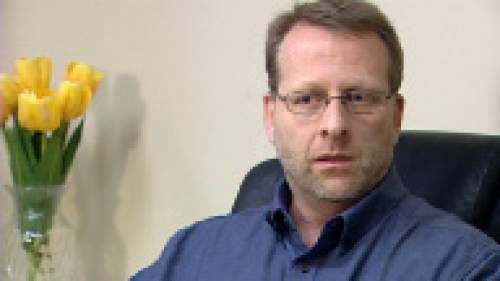 Trupp said his association believes the first priority of the proposed commission should be additional investigation into the intricate problems within individual counties. And by all accounts, the problems with the current system are complicated. The 6th Amendment Center cited a lack of uniform structure and inconsistent, inadequate funding that varies from county-to-county. And public defenders are given crushing case loads and won&apos;t  or can&apos;t  ask for funds for experts or private investigators. Lowe said some county prosecutors are involved in picking who fills public defender contracts, in essence hand-selecting who they will go up against in court. They aren&apos;t problems that can be solved easily  or quickly. "I imagine for people embroiled in the criminal justice system right now, it&apos;s taking too long," Lowe said. "Meanwhile, their lives are being destroyed or, in some circumstances, severely compromised. We&apos;re sort of at the point of feeling like there has been more than adequate and sufficient study and we know what the problems are. And it&apos;s time to really think about some solutions instead of pushing it off and thinking we need to have additional study." Weiler said he hopes his bill will be enough to fend off the ACLU&apos;s threatened lawsuit. "There are some problems," he said. "We know there are problems. It&apos;s going to take some money and it&apos;s probably going to take a couple of years to get where we need to be." Meanwhile, one attorney has filed a proposed class action lawsuit on behalf of criminal defendants who were given public defenders in Washington County. The lawsuit claims public defenders who work those contracts are overworked, underpaid and are not given the proper support to defend their clients. The national standard case load for felony cases is 150 per year, according to Hart. But in 2015, one public defender said he and another attorney in Washington County closed out 712 cases, and 540 of those were felony cases. They were paid, on average, $140 per case. Washington County administrator Dean Cox said they won&apos;t be making any changes to their public defender contracts until they see what happens at the Legislature, but pointed out that his county does have a separate fund for defense experts and other expenses which public defenders have access to. "This is something that I take very seriously," Cox said. "I know that the county commission does, as well. It benefits no one when defendants are inadequately represented." He said he asks his clients to call or email him before their court appearance  though most rarely do. That can leave him just minutes to speak to a client before they go before a judge. And time with a judge is at a premium on any given day. An upcoming calendar for the Springville justice court where Nielson works shows 33 people scheduled to see the judge at the same time. A third of those clients are already assigned to Nielson, but more could become his clients if the judge decides they qualify for a public defender. In district court, the caseloads are even higher. An upcoming morning calendar for a 3rd District Court judge in Salt Lake City lists 163 defendants. But Nielson said his work extends beyond the courtroom. When court is over, he researches cases, watches police videos and reads reports, usually well into the evening. For all that work, Nielson&apos;s public defender contract pays him just over $22,000 a year  or about $1,800 a month. From that, Nielson said he has to pay for health insurance, office space, paper supplies and travel expenses. He said he can&apos;t afford to hire a private investigator, and there is no discretionary fund for requesting an expert or other defense costs. Nielson said he also doesn&apos;t have the funds to hire an office assistant, so his wife helps sort his files and get papers in order. He estimates that between the two of them, they work 200 hours a month. After deducting the aforementioned expenses, their take-home pay is about $400 a month. "So we come out with about $2 an hour," he said. "It&apos;s not cutting it." Nielson said he tries to take on a few private clients to help make ends meet  but his caseload has gotten so large that he has little time to handle more than his public defender cases. He said he also covers court appearances for other attorneys, if he has time, to make a little extra money. Nielson said he has asked the city for more funding, but was told to wait until the legislative session is over. "It&apos;s not a fair price," said Nielson of the flat-fee contract he has held for about four months. "The flat fee itself is not the right method for finding a public defender. You are encouraging them to do zero work." He said if things continue on as they are, he worries he won&apos;t be able to continue with the contract. But Nielsen said it is a job he wants to continue doing so that he can help people. "I don&apos;t really want to go back to dealing with high profile [district court] cases," Nielson said. "I would much rather stay with the justice court. I love helping people that made a mistake and it&apos;s a mistake that we can fix."